RIO DE JANEIRO, BRAZIL – The Theatro Municipal in Centro is one of Rio’s most significant cultural landmarks, serving as a performance center and an architectural attraction. Originally built in 1909 the theater was refurbished in 2010, the theater has hosted U.S. President Obama’s visit to Rio, as well as world renowned music and dance for the city’s residents and travelers alike. 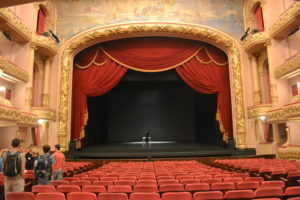 The theater’s stage continues to receive performing arts groups to this day, image by Nicole Froio. In line with the rich history of the theater, which has seen such notable performers as Maria Callas, Igor Stravinsky and Sarah Bernardt perform in its illustrious walls, the theater’s reputation continues to bring remarkable entertainment to Brazil today. On the weekend of March 2nd and 3rd, the UK Royal Ballet performed a medley of the most well-known classical pieces and ballet dances. The month of April will see the showing of Giuseppe Verdi’s famous opera Aída and in May, Swan Lake will be performed by the theater’s own ballet company. The Theatro Municipal is overlooking Praça Marechal Floriano (also known as Cinelândia) and surrounded by a number of historical buildings and museums, such as the National Library and the National Fine Arts Museum. The elegant staircase is one of the most beautiful sights inside the theater building, image by Nicole Froio. The theater is not only a house for the performing arts in Centro, but also a building with stunning architecture and design. It is designed in an eclectic style and was inspired by the opera house in Paris. The visual highlights continue in the inside of the building, with sculptures by Henrique Bernardelli and paintings by Rodolfo Amoedo and Eliseu Visconti. 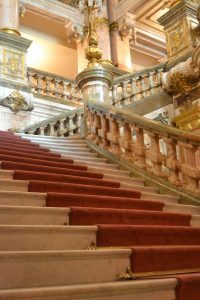 Furthermore, visitors to the theater get to explore an old Gothic salon, a glamorous red carpet staircase, the theater and several old rooms with historical decoration. The venue offers daily guided visits through the interior of the Theatro Municipal from Monday through Saturday in English or Portuguese. Sonja Figueiredo who works at the theater and is in love with its history, said she believes the tour is an important spot for any tourist who wants to know more about Brazilian culture. The Theatro Municipal was renovated from 2008 until 2010, making a visit today even more pleasant. The extensive renovation included much-needed practical as well as aesthetic repairs and allows the theater to now present itself in its original glamor. Thanks to the Rio Metrô, the theater is easily accessible from Zona Sul (South Zone). It is located just across Praça Marechal Floriano, when exiting the Cinelândia station. The ticket price for the guided tour is R$5 half-priced and R$10 full price, and the ticket desk recommends arriving half an hour before the visit to guarantee entrance.